For the 4th of July weekend my family and I took a very much needed family vacation to North Carolina. We visited some family and met up with my our best friends the Nelsons. We spent the weekend together and had a blast. While there we visited Bald Head Island. If you haven’t been there, I would definitely add it to your bucket list. It is storybook perfect, and very authentic. There are no cars allowed on the island so you ride golf carts everywhere. The island is peaceful and quiet, and the beaches are beautiful and well kept. Ill have to do a separate post about it. All I have to say is, “GO, just go!” you won’t regret it. Anyway, although it was a fantastic weekend, it was also very humid and HOT there. Before our trip I was determined to find knee length dresses I could wear on hot North Carolina days. Boy am I glad I found this number. Not only is it adorable, but its light and breezy so you never get too hot. Plus, its KNEE length. I don’t know about you, but its always been really hard for me to find dresses that touch my knees. I would suggest sizing up a bit. Im usually a size 2 in H&M dresses, but in this case I bought a size 6 for length. 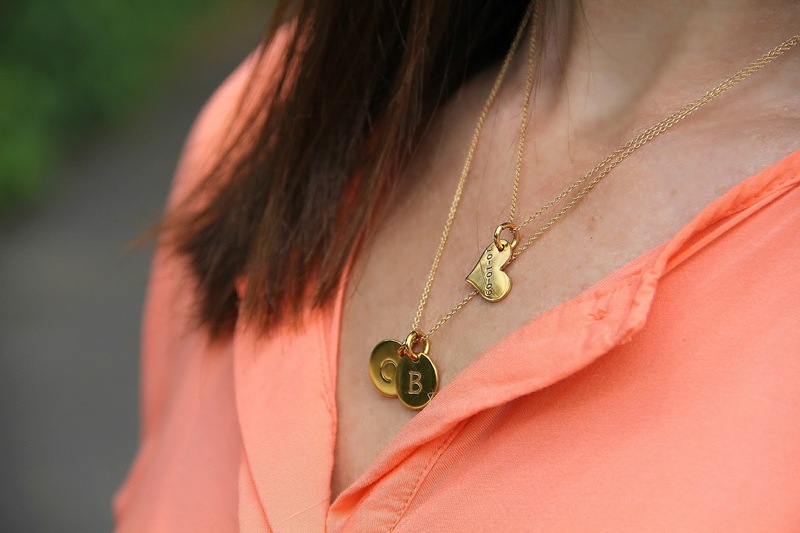 I also wore this adorable dainty necklace combo from Tiny Tags– It has both my boys initials on them, and a heart with my husband and I wedding date. I love knowing that I can hold a little reminder of them close to my heart wherever I go. Hope you love it as much as I do! Happy Tuesday everyone! Next Post Nordstrom Anniversary Rewards Members Early Access Sale!!! I love the versatility of this and the color is gorgeous on you! Love the color of the dress. Plus it is so versatile, making it perfect for any occasion. I love the color of this dress and It really is the perfect knee length. Also loving those lace up sandals! I always struggle ordering gladiator sandals, they never fit correctly. However, these look right up my ally! I love this dress! The length is perfect! You look gorgeous! Perfect color of dress – awesome H2T look on you! Love this dress! The color is phenomenal on you. Those lace up sandals are so pretty! 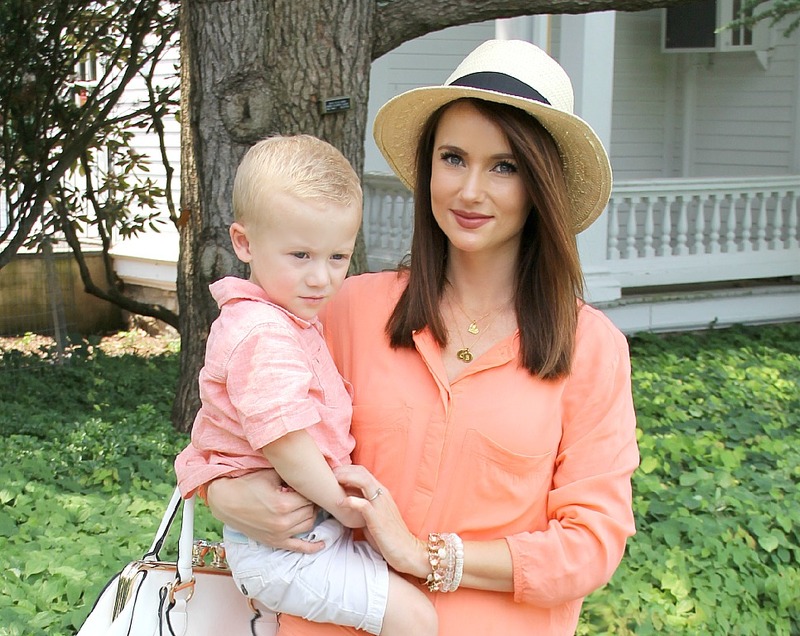 I love the coral shift dress, such a great color for summer! You look amazing, my love! Knee length dresses are my favorite, and how cute are your boys?! Are you even real? Seriously one of the prettiest girls I have ever seen, with awesome style on top of it! Great look. Gorgeous color. The length is perfect on you. I'm not a column silhouette girl but I do like this piece. Looks easy enough to belt at the natural waistline. Such a cute casual look – love the gladiator sandals! Great color on you! So pretty! Such a perfect Summer look! In love with those sandals! 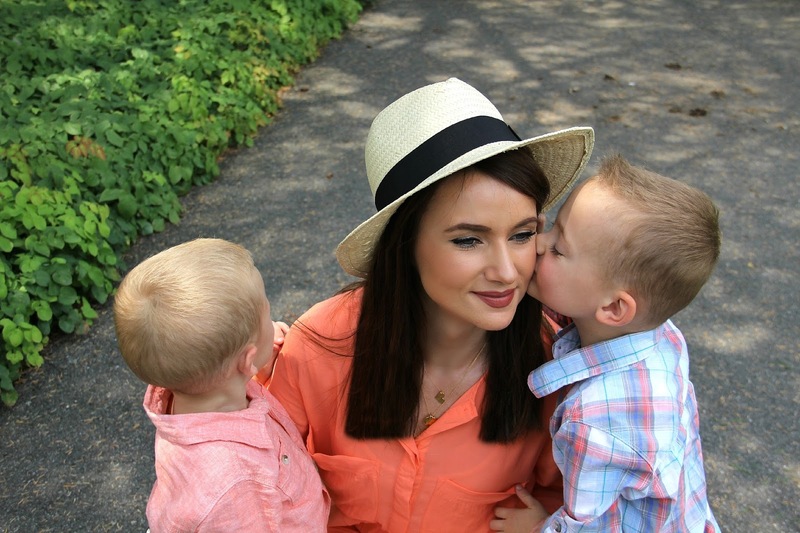 Oh, how I adore your easy, breezy lightweight dress here! Very beautiful airy outfit looks effortless, I love your strappy sandals, you look so cute!